DRDA Gajapati Recruitment 2018 notification is carrying out 60 Multi-Purpose Assistant (Gram Rozgar Sevak) Vacancies for the Gajapati District Gram Panchayat, Odisha. Wiling ones may start to apply from 8th Nov to 6th Dec 2018 through suggested portals by downloading the Gajapati Gram Rozgar Sevak (GRS) notification as well as offline mode application forms from their web portal @ www.gajapati.nic.in. 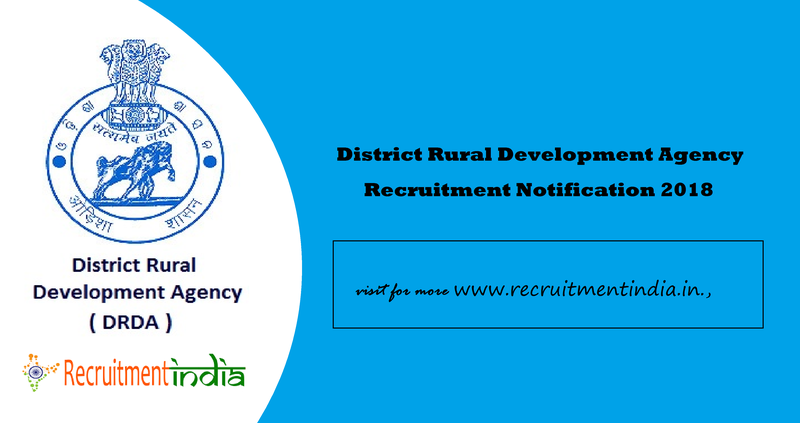 District Rural Development Agency, Odisha – The Job seekers from Odisha. Especially from the district of Gajapati, would you a job seeker in Odisha? Would you look for any job chances in 2018-19? then Gajapati Gram Rozgar Sevak (GRS) Recruitment 2018 may be helpful for you. As per the present survey, the most positive picture emerged job chances in the post of Multi-Purpose Assistant (Gram Rozgar Sevak) in terms of jobs, where totally60 Gram Rozgar Sevak (GRS) vacancy. DRDA Gajapati district decided to fill the vacancy with DRDA Gajapati Recruitment 2018, as per the quarter of registration. Check out more Odisha Govt jobs. In the District Rural Development Agency organization at Gajapati District Gram Panchayat, Odisha location more than 60 Gram Rozgar Sevak vacancies are to be recruited. The deadline for registration is still in existence. Willing ones have the last date for applying in offline mode is up to 6th Dec 2018. This recruitment includes the Gram Rozgar Sevak posts, eligible and profiles matched persons would start to apply now. Let’s know in detailed at these appointments of DRDA Notification. Latest Recruitment Notifications of 2018 are placed at here. Must be a resident of Gajapathi District. It including the details of DRDA Gajapati Multi-Purpose Assistant Notification. Approximately,60 Gajapati District GRS Jobs is ready to fill up with Some new talented persons (Male/ Female). The quarter for registration is from 8th Nov to 6th Dec 2018, after this 6th Dec 2018, the unit of District Rural Development Agency will be stopped to accept the forms of Multi-Purpose Assistant (Gram Rozgar Sevak) jobs. Kindly note, all seekers must be as in the eligibility criteria is given in the main article. Look for more latest update related to the Odisha Recruitment Written Test Hall Tickets in 2018 at here. No application fee is considered from anyone to fill the application form of DRDA Gajapati 60 Multi-Purpose Assistant (Gram Rozgar Sevak) Jobs. Under the qualifications only, the seekers will be accepted for this DRDA Gajapati Recruitment. The certifications are 10+2, which was specified by the Central or State University or Board. Mainly, the age relaxation is must and should like terms and regulations placed in the announcement. Under of 20 to 40 years of aged persons would only allow for further, More or below aged applied for this recruitment, they would be rejected. Remember, 6th Dec 2018 is the final date to entering your names in the DRDA Gajapati Application form with proper info after it will be terminated. We wish you all the best of luck. Please, visit official website www.gajapati.nic.in., then later hunt for main notification as well as registration forms and download them. Afterwards, fill up the blanks with correct details as per the requirements. Submit the click button & take a hard copy. Enroll your names within the due date of 6th Dec 2018. Thank You… for selecting our article!!! Hallo sir/mem good morning .I am Rattna.i am secured 10th or +2th board exam above 64%mark. My streem is arts. I have no computer certificate. So can i get the grs job. please call me in this no 7381854087. I want about grs job. Sir I am interest in GRS Job. Please inform me. It is almost going to b 1 year. The “GRS” vacancy was Declared on February-2018.Why it is delay so..?